On 22nd September 2018, AFRIL hosted its first Community Dinner in partnership with the Damascus Chef. Three of our Foodbank members prepared a three course buffet-style Syrian dinner in order to raise funds for AFRIL’s Helping Hands Foodbank. 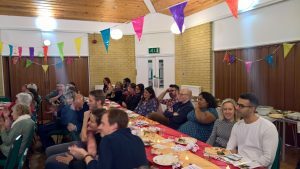 The dinner provided Lewisham and other South London residents the opportunity to meet, socialise, and share delicious food with our beneficiaries. 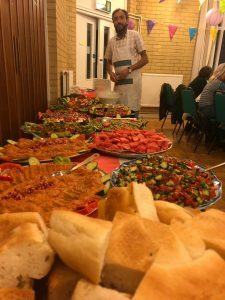 Hosted at the Forest Hill Quaker Meeting House, our guests enjoyed an array of authentic Syrian food while violinist Elisabeth Flett provided the evening’s entertainment. The evening also presented a great opportunity to engage the local community with the work of AFRIL and introduce them to our beneficiaries. The community dinner was a huge success, from ticket sales we were able to raise £525 for the Foodbank. A big thank you to everyone who came and who helped with the night! Like this event, our Community Dinners will follow the theme of our members’ cultures. Look out for future dinners which will offer Persian, West African, South Asian, Middle Eastern, and many other cuisines. We look forward to hosting the next dinner which we hope to take place in December!